Lots of progress again inside now that we're not so reliant on the conditions outside. Graham and Rob came back to help with the lining. Most of the bedrooms now have walls and doors and it's really starting to look like a house (The doors for downstairs however were all the wrong size so have been sent back). Debs and I have been busy putting the first coat of primer on the woodwork. Debs doing her first bit of housekeeping. 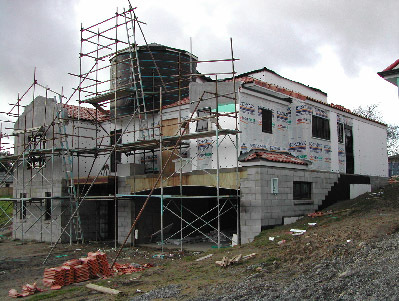 The house is lined with a variety of gib depending on the application. These include Braceline (for additional strength in some of the external walls), Noiseline (for soundproofing), Aqualine (for bathrooms), and Standard. 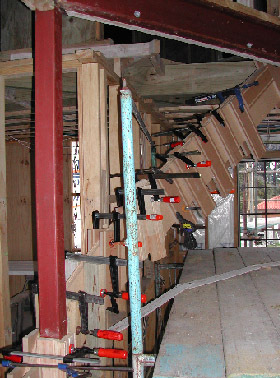 Where possible the gib is mounted horizontally to cut down on the number of joints (and potential cracks). Rex from Quality Doors and Stairs has started building the staircase up to the crows nest. He began by making an MDF template to get the curve right. He then laminated additional layers of MDF to it until it was strong enough to hold its shape back at the factory. All of the treads and risers were then made back in the workshop and brought back in pieces and assembled on site in kitset form. This was quite a time-consuming process but the only feasible way of doing it given that the house construction is so advanced. We're very pleased with the result and are now considering having the staircase open so that it will be visible when looking up from the entrance gallery. The glass blocks have been installed and actually look better than we had hoped they would. The rest of the street is really starting to take shape as well (as viewed from the top of our scaffolding).